What happens when you turn a Philip Marlowe or a Patrick Kenzie into a wizard? 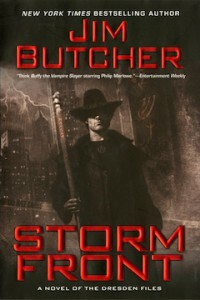 Honestly nothing too earth-shattering, at least not in this first novel of the popular Dresden files. Mostly the book rides on the novelty of turning femme fatales into vampires and having the wise-cracking and laconic protagonist mix things up by shooting lightning instead of .38 caliber slugs. The charms of a solid, hard-boiled detective story detective story still linger, but where a writer like Dennis Lehane allows each new scene, every fresh twist to fluidly peel away the layers of his complex and engaging characters and build up to a thematically coherent climax and denouement, Butcher blusters crudely and rather floridly over the action through his protagonist, trying to imbue comparatively flat characters and a tightly structured, but by-the-numbers plot with more emotional force than either element has a right to. Dresden mentions his requisite troubled past several times, but the conflict at hand has only superficial bearing on Dresden’s inner turmoil, and so aside from the most basic stakes of wanting to see Dresden survive the physical danger posed in the story, there isn’t much to encourage a reader’s investment in the character over the course of the novel.